The Carb-Sane Asylum: Eating more fat ... Why where ever did anyone get that from? Eating more fat ... Why where ever did anyone get that from? I wrote the diet/lost my weight and kept if off for years while veggie. This involved eating more carb meals than fat meals - porridge daily, usually a fat (cheese based lunch) and a carb brown rice/rice pasta dinner. I still eat a lot of carb meals. Harcombe's epiphany apparently came at a WAPF event in April of 2010 when she abandoned her morality-based vegetarian status for healthy meat eating. This was all rather interesting to me as she appeared poised to rebrand as a low carb diet guru as that year wore on. She is a devout parrot of the teachings of TWICHOO. I believe to this day that it is relevant to the discussion that Harcombe did not lose and maintain her weight loss on a low carb diet, or one based on meats and such. Her diet is hardly paleo so it appears she's returning to her roots of branding her diet as a real foods diet (that used to include wholemeal pasta and bread, for what that's worth). I guess NuttyK was just a bit much for her tastes, and kudos to her for not trying that! But Zoe is concerned. Where did all this talk of eating a ton of fat or eating more fat come from? For those who are more carb sensitive and who just don't do well with carb meals, the golden rule is still eat real food. This means that your carb intake will be naturally low and your fat/protein intake naturally high, but don't try to eat fat for its own sake any more than eating protein for its own sake - just eat food! Don't fear fat, as part of real food, but people adding butter to coffee or trying to eat olive oil for the sake of it - why?! Neither butter nor olive oil are particularly nutritious. Butter is better than olive oil - but these are not staple foods - they are things to cook with. Someone get Jimmy and Asprey on the line, pronto!! I don't want to quote more because it's a short post, hence my filling in of some details as well, but I get the feeling Zoe seems flummoxed by this trend of upping the fat and does not wish to be associated with it. This trend is really nothing new. I was shocked back in 2009 when I found the LC internet community to keep hearing this, and "up the fat" had been all the rage of advice through 2010. It did seem to wane a bit in 2011, but NuttyK and intermittent fat fasting does appear to have revived it for now. Atkins said we needn't fear it and boasted that you could lose weight eating fatty foods, but even his "fat fast" was calorie restricted so that it wasn't that much fat compared to a normal caloric intake and macro balance. I love butter. Smothered on vegetables or, best of all, melted over a juicy sirloin steak. And I eat masses of red meat – lamb chops or my favourite, pork belly. Sometimes we’ll put a piece in the oven at lunchtime, and slow cook it to make the crackling really crunchy by evening. My only two rules are that the meat has to be good quality and that all the fat is left on. As a food expert, I spend my working life imploring the public to eat a nutritious diet – so I know these may sound like odd admissions. What I am suggesting flies in the face of everything you have heard about healthy eating. But I firmly believe that we all need to eat more fat – including the much-demonised saturated fat. I’m not talking about junk foods but fresh meats and dairy. 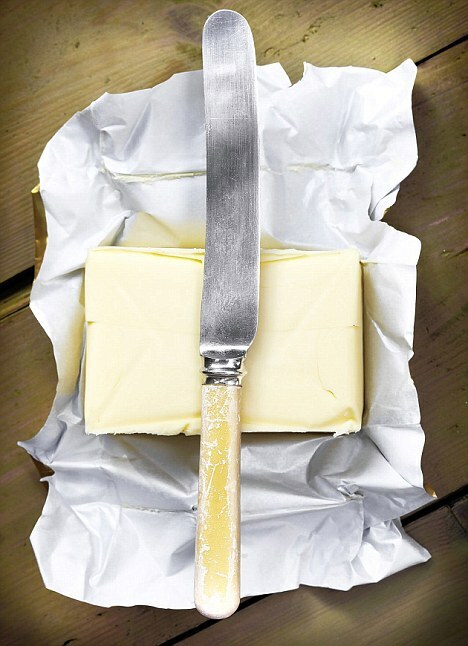 There should be a shift back to butter, full-fat milk and red meat – all often labelled high sat-fat foods – as they are nutritional gold mines. Say what? When in 2012 did this change? ... In my opinion, there shouldn’t be any limit for fat consumption. But won’t we get fat? Not at all. There is little evidence that eating fat makes you put on weight. ... The body absorbs the fat it needs and excretes the excess. I’m not saying don’t eat carbs – glucose is needed to supply the brain with energy. The next time someone makes that claim on the internet, they can source Harcombe for that "fact". Zoe might want those forum people who are following her diet for weight loss to follow her instructions exactly, and the general public to consider fat more sensibly as the food it is. However, her book is somewhat confusing. I like her blog and her other outbursts and her shake-things-up attitude but the book seemed a little too Leslie Kentonesque. A high fat (by percentage) diet isn't the same thing as a high fat (by grams) diet. Oh, boy! Which book? I've read most of Obesity Epidemic and many excerpts of other books but not entire books. IAC, are you condoning saying one thing to the public and another to your readers? A classic from The Obesity Epidemic: "We know that stored carbohydrate, glycogen, is turned into fat if not needed by the body within approximately 24 hours." Say you're doing as well at Chemistry, and as you are doing at Maths Extension 2, then instead of splitting your study time equally between the two (just because they are both worth 2 units each), you should spend more time on Extension 2, simply because it scales higher. If you want to be able to hit the ball further and harder, you should keep in mind to keep your grip on the bat loose, your swing should begin with your legs and hips, and finally, you must always follow your bat through. I suspect Zoe is gradually realising that there is a slight problem with her 'calories don't count' message. She's obviously a smart woman but I think she started out on the wrong nutritional track, probably due to her mystery qualifications which I would guess were of the 'holistic' variety. But, given the criticism she must have read in recent years from bloggers like yourself and other nutrition experts, as well as the struggles many of her forumites face losing weight (who are often advised to 'up the fat' from other forumites), she must be getting the idea that she needs to start building a bit of calorie control into her diet, but without actually saying it in those terms! One thing I don't hear being talked about in the LC community, is that tons of sat-fats appear to cause insulin resistance in skeletal muscle tissue. That can't be a good thing IMO. I find myself slowly leaning more and more toward the idea of CURING "carb-intolerant" people's underlying insulin resistance rather than hiding from it via VLC. Though carb restriction may be required for a period of time. But when guys like Dr. Joel Furhman are routinely curing people of T2 diabetes, with a high-ish carb diet of whole foods, it kinda makes ya think. Excellent analysis. When I read a synopsis PDF of her diet I thought it rather unappetizing. Plain oat porridge? She strikes me as someone who lost a little bit of weight (if any, eating disorders can be great for maintaining low weights despite binging periodically) and figured becoming a diet book author was the way to go. She contradicts herself at every step because the calories don't count meme doesn't marry with her 20 years of research that have identified the causes of overeating (say wha?!) ... those being candida, food intolerances and hypoglycemia (http://www.dailymail.co.uk/femail/article-2259048/Why-DO-overeat-want-slim-Zo-Harcombe-author-new-book-claiming-end-food-addiction-reveals-finally-won-battle-bulge.html -- does she know someone at this rag?) . Funny how none of these three causes of overeating make it into her "academic work" The Obesity Epidemic. Food intolerances are given mention in a conspiratorial wheat industry context, but no mention of either of the other two. You mean like a doctor might prescribe an antiobiotic to a patient, yet advise the general public that they're over-using antibiotics? Zoe's book is called The Harcombe Diet. Zoe has many books. Antibiotic analogy is irrelevant. I loved as much as you'll receive carried out right here. The sketch is attractive, your authored subject matter stylish. nonetheless, you command get bought an edginess over that you wish be delivering the following. unwell unquestionably come further formerly again since exactly the same nearly very often inside case you shield this increase. change it between horizontal and vertical if you want. images to the target audience with the intention of optimized brand familiarization. I'm into the food combining woo to some extent. I tend to eat either a high fat meal or a low fat meal but rarely mixed fatty high carb meals. I'm not exactly sure why I still do it but for some reason I still think it's the way to go. Maybe i just have some kind of ED. BTW, if excess fat was just "excreted", or peed out in ketones as Dr atkins claimed then why wouldn't people be sloshing on spoonfuls of fat to everything they eat? I believe there's something effective in separating the two because combined they create very palatable foods that are easy to overeat ad libitum. Just because we're omnivores doesn't mean we are necessarily designed to eat mixed meals. Such foods don't really occur in nature. Here's one comment from a familiar poster. I wonder how long before this little snippet becomes part of the mythology. 'It interested me that they added virgin olive oil 1 liter / week or 30 grams of nuts / day. I can match them on the drinking wine ≥ 7 times / week but both of us don't manage a litre of virgin olive oil each week. Most of the comments seem to agree that 1 litre is a lot and so it is. 1 litre of olive oil would give the participants 1285 calories a day from olive oil. Did they really have that much? Did they eat 30g nuts a day? Hi Jeff, that point has been addressed before if I recall correctly. Basically boils down to pathological is not the same as physiological. Exercise before eating causes insulin resistance too, and that's not to be avoided. I think what you'd need is to see is some well controlled prospective cohort studies showing a clear association. As far as I know those trials don't exist. Ok, I admit I tried the butter coffee. It's tasty to me and basically butter is just heavy cream that's been beaten to death so I didn't find it very different from coffee with real cream. Using EasyHits4U you can earn free advertising credits by viewing other ads from a account base of over 1.2 million accounts. Earn advertising credits faster with a view per view model. New Diet Taps into Pioneering Concept to Help Dieters LOSE 15 Pounds in Just 21 Days!